Naphthalene is derived from two sources—coal tar and petroleum. In 2015, over 90% of the world’s naphthalene was produced from coal tar; the remainder was from petroleum. Petroleum naphthalene capacity is concentrated in China, the United States, and Western Europe. Over the past decade, China has become the world’s largest producer of naphthalene, accounting for 64% of total global naphthalene capacity. China is the world's largest market for naphthalene, regardless of whether it's used in naphthalene sulfonates, phthalic anhydride, or dyestuff intermediates. 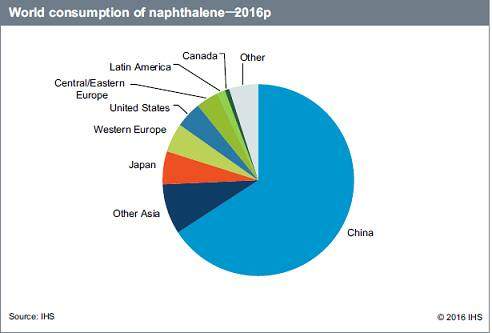 In 2015, Chinese naphthalene consumption accounted for 65.7% of global consumption. Chinese naphthalene sulfonate consumption accounted for approximately 80% of the world's total consumption. The major global outlet for naphthalene is in the production of naphthalene sulfonates, accounting for 54% of naphthalene consumption, and China is currently the largest market for naphthalene sulfonates. Much of China's expansion was influenced by strong demand growth in the use of naphthalene sulfonate–formaldehyde condensate (also known as superplasticizer) in concrete admixtures, but in recent years this has been affected by a shift to polycarboxylate superplasticizer. In Central and Eastern Europe, naphthalene consumption in naphthalene sulfonates grew almost 22-fold from 2011 to 2015. It will exhibit the strongest growth globally, at about 2.4% per year in the next few years. The second-largest market for naphthalene applications is phthalic anhydride, but although phthalic anhydride production in most countries is by raw material ortho-xylene, in China, the world's largest phthalic anhydride market, naphthalene-based phthalic anhydride production has risen in recent years. Naphthalene-based production is often chosen in lieu of fluctuating petrochemical (o-xylene) feedstock; phthalic anhydride production accounted for more than 80% of total naphthalene demand in countries such as Japan and South Korea. That makes the contribution of naphthalene for the production of phthalic anhydride roughly 22–25% of global naphthalene demand in 2015. Globally, demand growth for phthalic anhydride is forecast to be about 4% annually during the forecast period. Increased environmental pressure placed on naphthalene use in pesticides, dyestuff intermediates, and solvent applications has contributed to demand declines in most industrialized regions. The United States, Japan, and Western Europe are forecast to experience less than 1% average annual growth through 2020, while developing regions (China, India, and the Middle East) will continue to exhibit the fastest demand growth, ranging between 3% and 4% annually. The global naphthalene market has steadily grown to meet the global demand. During 2015–20, overall world consumption of naphthalene is expected to grow at an average rate of 2.8% per year.